Supervisor Mark Ridley-Thomas joined more than 7,000 volunteers who fanned out across Los Angeles County over three nights for the 2019 Homeless Count, a federally mandated annual census to guide programs and services where most needed. At a press conference, Supervisor Ridley-Thomas noted the results of last year’s Count showed a decline for the first time in four years, and he stressed the importance of sustaining that momentum. 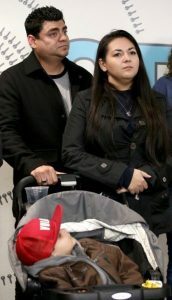 Priscilla and Ryan Coughran and their young children were among those who participated in this year’s Count. The family had been homeless themselves until the County stepped in to provide them with housing and services. Now, the couple is determined to help others who are still struggling, while also teaching their sons an important life lesson. “Us experiencing homelessness as a family, it was important to us that even after we got housed that we didn’t forget that, that our boys didn’t forget that,” Priscilla said. The data from the Count offers a comprehensive look at the state of homelessness in Los Angeles County on any given night, including geographic distribution and trends among various populations. The results will be released in May 2019. The 2018 Count showed the number of people experiencing homelessness decreased to about 53,000 people — a 4 percent drop from 2017, and the first decline since 2014. Both the County and City of Los Angeles are working to sustain that progress with Measure H and the County’s Homeless Initiative, Proposition HHH, and other initiatives combat homelessness. Thanks to Measure H, the County has moved nearly 10,000 people into permanent housing since July 2017, and placed nearly 18,000 people into temporary housing during the same period. More than 700 outreach workers are now working across the County helping homeless residents access housing and support services. 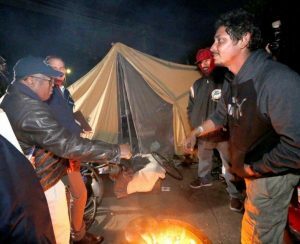 Supervisor Ridley-Thomas greets residents of a homeless encampment on the first day of the homeless count. For those unable to participate in the Count, they can still direct street outreach teams to their unhoused neighbors by using a new web portal called Los Angeles Homeless Outreach Portal or LA-HOP. Funded by Measure H, the mobile-friendly platform empowers members of the general public, first responders and service providers to provide information on homeless persons on the street and request outreach. 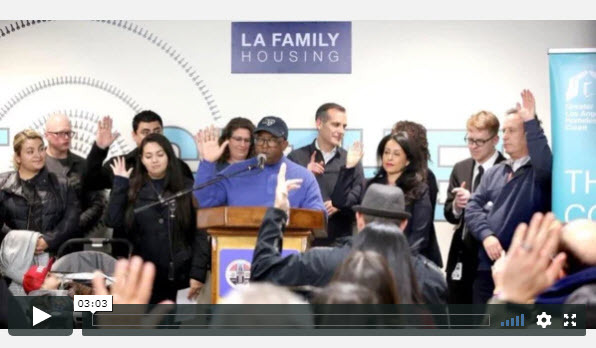 LA-HOP is a valuable new tool to get services to vulnerable residents living on the street. It makes it easier and more efficient for the public to request help and have it dispatched to connect homeless persons with outreach workers.